The Moroccan décor trend is set to rein for another season, as textured rugs, metallic lanterns and patterned floor tiles continue to fill our homes with bohemian vibes. When it comes to décor Morocco is brimming with inspiration, as the Arab country’s varied history, architecture and culture offer an enriching muse for design, colour and texture. Bringing souk style into your space, we’ve listed ways to introduce Morocco’s exotic, yet elegant elements into your home –whether you want to be bold or subtle. 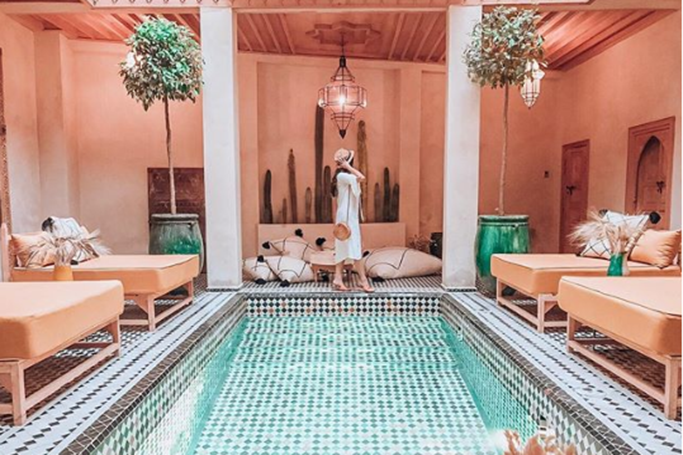 Moroccan design brings the outdoors in and centres itself on being cool and comfortable, which is also essential in Dubai. Vibrant colours are blended with adorned furniture and accessories, to create an idyllic indoor oasis. Whether you’re taking interior inspiration from colour hues or textured layers with flair, here is some must-have Moroccan style for your décor –expect an abundance of tassels and tiles! You can place a Moroccan pouf almost anywhere in your home, and it instantly adds magic to the space. The pouf has been a Moroccan tradition for hundreds of years, serving as a fancy footstool or floor seating option. But, why not give the furnishing accessory a new twist as an alternative to the end-of-bed bench or a coffee table, throw some magazines on top and pouf –you have a new feature to admire. Who doesn’t love a cultured cushion?! Decorative, detailed and definitely a décor must-have, Moroccan throw pillows add a hint of North African charm to your abode, without going full bohemian-chic. So pile up the patterned pillows, add a pop of colour and get on board with trendy tassels. Moroccan décor brings the outdoors in, which is so relatable in a Middle Eastern climate. Consider carrying garden furniture and outdoor lanterns into your indoor space; add baskets, woven wood and plenty of potted greenery for an idyllic oasis effect. Floor cushions also work well and hanging plants always bring a space to life –even faux flowers can make your home flourish. The streets of Marrakesh are flourishing with colours and creativity, as bright and bold jewel tones are a common element of Moroccan palettes. From emeralds to rubies and sapphire blues, these tones will add a unique sparkle to your space, and add an Arabian flair throughout. Mix up the vibrant colours or stick to one shade. A Moroccan tray exudes timeless beauty and can make a statement as a decorative feature or used when entertaining. It’s authentic, yet can be effortlessly placed in a modern space; hang it above the bed, place it on a shelf or layer it into an arrangement. From silver to gold and even wood, find a tray with an intricate design that will compliment your interiors. No Moroccan-inspired room would be complete without a patterned rug! If there’s just one detail you want to take from this trend, it should be a woven rug –or magic carpet, as we like to think. From diamond patterns to vibrant colours, there is an endless amount of choice when it comes to Moroccan rugs. Layer them up, add one to every room and find the perfect rug for you! Moroccan magic can made in any corner of your home, from window seats to a selected space, introduce Moroccan-inspired accents to create an enchanting alcove. It can be your chilling zone for relaxing, thinking, reading or writing, as you can use layers, textures and candles to decorate the space and make an idyllic corner. The Moroccan-style tile is especially eye-catching, from the floors to the walls; it’s a signature statement in any Moroccan space. Although we can’t all fill our apartments with geometric tiles, consider making a feature with the design –whether it’s in artwork, the bathroom or the kitchen. This authentic decoration will bring you traditional Hamman vibes. Moroccan design is all about texture, as you need to weave this essential element into rooms through blankets, linens, pillows, wall hangings, rugs and an endless array of patterns. Don’t be afraid to clash, sometimes the busier the better when it comes to textural trends! If you don’t want to be too bold, consider textures with the same colour pattern –so you can still create the desire impact, but with stylish monochrome look. It’s all in the details. From fashionable woven baskets to lanterns and artwork, filling a shelf or space with hints of Moroccan flair is sure to spruce up your interiors. Layer details, consider depth and arrangement and most importantly, have fun with creativity. Moroccan details are great for your style experiments –see what you can come up with! You don’t have to introduce crazy colours to pull off the Moroccan décor trend, as subtle shades can work just as well. Choose a lighter rug with a subtle pattern, opt for earthy tones in two or three colours and add textured, yet neutral, fabrics to the wall –for an understated touch that still has an inspired impact. If you want an effortless way to successfully transform your space into a boho haven, simply add patterned pillows, low wooden tables, touches of greenery, layer textures and fabrics and go bold with jewel tones –then throw in a pouf and a few lanterns.